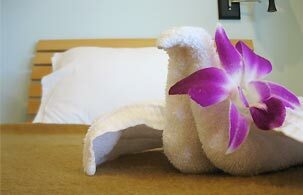 Phuket Center Apartment features the most comfortable 69 rooms for daily and monthly rental. We welcome you to explore the fascinating natural surrounding while your time will be fulfilled with the highest quality and standard staying in Phuket. Lay down your back in our well-furnished room which is designed in luxurious modern style. Phuket Center Apartment ideally located in the heart of Phuket town while surrounded by fully comfortable atmosphere including the transportation and other utilities.